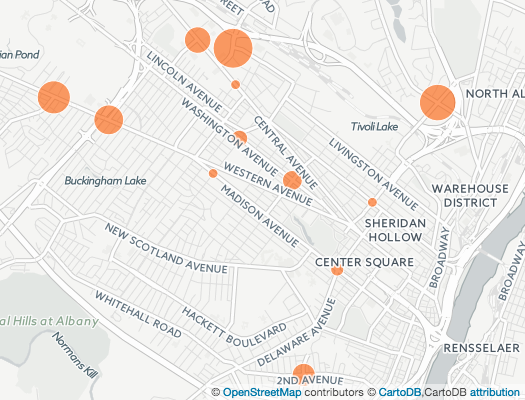 This map shows how many violations per day that were registered at each intersection. Why violations per day and not total? See below. So, this is a table of how many violations and citations were registered and issue for each intersection approach (not every approach for every red light camera intersection has a camera watching it). We've done a little math to calculate the number of violations issued per day since the system has been in operation (and issuing citations) at the intersection. Why? Because different intersections have been in operation for different lengths of time, so just comparing the raw totals isn't really a good comparison. Also we computed a "false positives" rate for each approach to get a sense of how often the system is flagging drivers for something an officer ultimately decides isn't actually a violation. One thing this doesn't account for is traffic volume at each intersection. That would give an even better sense of the situation. NB = northbound, SB = southbound, EB = eastbound, WB = westbound. + The city released numbers for the period July through October 2. + The city data release had "SB Central at Colvin" listed, but we're relatively certain that should be "WB Central at Colvin," as that was previously announced multiple places. + For whatever reason we couldn't find the activation date for Central and King. If you know it, please share. + We have omitted the approaches WB Madison at New Scotland and SB Lark at Madison because we had some trouble reconciling some of the numbers and dates for those intersections and we're hoping to hear back from APD about it. Here's basically the same table, but now all the approaches are grouped by intersection. A map depicting the number of violations per day per intersection. There's a larger, clickable map after the jump. The city of Albany released the first batch of numbers related to its new red light camera system this week. The APD reports that since the cameras started coming online in July, the system flagged 2,197 potential violations. After reviews by officers, the city sent out 1,356 citations. So about 38 percent of the potential violations were screened out by the human review. The easiest way to walk through this is to just have a look at the maps and tables above in large format (click or scroll all the way up). We'll explain up there. + So Everett Road/Watervliet Ave and Northern Blvd/Albany Shaker Road both stand out for high rates of violations. It's worth looking into what's going on in those spots and whether it has something to do with the design of the intersections or some other factor. Or maybe they're just high-traffic-volume spots. + Similarly, some of the intersection with high "false positive" rates are worth a look. Example: Westbound Western Ave at Russell Road had the second-highest false positive rate -- and it's that intersection that for so long has had the weird double "stop here" line. ahem, that "weird" double stop on Western and Oxford is so residents of Oxford Road can turn in and out of the street. Did *I* stop there before I lived on that street? Do I get thoroughly annoyed when drivers don't stop there, now that I live on that street? Revenue is a benefit of, but not for me the principal reason for, the cameras. The principal reason I favor cameras is that they get people to stop. Safety is paramount. Lower than projected revenues means more people are stopping at the intersections with cameras than we expected. That is a terrific result. We will never get statistics for the number of lives saved by the cameras because an accident avoided isn't collectable data, but I am convinced lives will be saved if they haven't already. The other 6 intersections would join the first group of 9 where cameras are not needed and are not profitable with just minor tweaks in their engineering factors including yellow times. If the engineering were fixed with longer yellow intervals at the 6 + 2 above, the entire money grab scam of the cameras would collapse in a sea of red ink losses. Have you been able to obtain any accident data from these intersections? "We will never get statistics for the number of lives saved by the cameras because an accident avoided isn't collectable data, but I am convinced lives will be saved if they haven't already." Not quite true. The number of accidents/injuries/deaths at those intersections prior to camera installation is known for any period of time we want to measure. The number of accidents/injuries/deaths say, one year later is also measurable. The difference (if any) can tentatively be attributed, at least in part, to the cameras.